Over the last 30 years, China’s economy has grown at an astonishingly high average of 10 percent per year. Its rapid growth and entrance on the world economic stage have generated much interest in how globalization affects the everyday Chinese citizen. Dr. Sun Jiaming, a sociology professor at Fudan University, elaborated on this in a public talk last week hosted by the Fudan-UC Center on Contemporary China. His research is focused on globalization in terms of characteristic, basic trend and how it impacts Chinese residents’ behaviors, lifestyle and value orientation as well as the consequence of local transformation. Dr. Sun began his talk with a review of the history of globalization studies. In recent years such studies have solely focused on the “global-local nexus,” or how globalization has affected communities at large. Dr. Sun takes an alternative approach by examining the “global-individual nexus,” arguing that because borders no longer clearly define the territory of nations, greater emphasis must be placed on examining globalization’s effect on individuals and the effect that individuals in the aggregate have on globalization. To analyze the global-individual nexus, Dr. Sun has developed a tool called spatial-social connection. This sociological approach includes four measurements. The first is whether or not an individual has worked in a foreign firm. The second is whether or not an individual has been abroad. The third is whether or not the individual has relatives abroad. The fourth and last is the frequency of which the individual surfs foreign websites. All of these metrics have seen explosive growth. As Dr. Sun points out, in the last 30 years, two million Chinese students studied overseas, five million foreigners immigrated to China and 41 million Chinese tourists vacationed abroad. Meanwhile, the number of Internet users in China has risen to approximately 500 million. These statistics coupled with the over 50 million overseas Chinese paint a very interesting picture about the exportation of Chinese citizenry and culture. These fundamental demographic shifts have created a strong Chinese presence all over the world. One of the most significant growth-driven changes in China has been the emergence of a strong middle class with increasing purchasing power as well as the ability to travel abroad. In 2011, 70 million Chinese went abroad, compared to 4.5 million in 1995. China’s tourists are now the world’s third biggest spenders behind those from Germany and the United States. 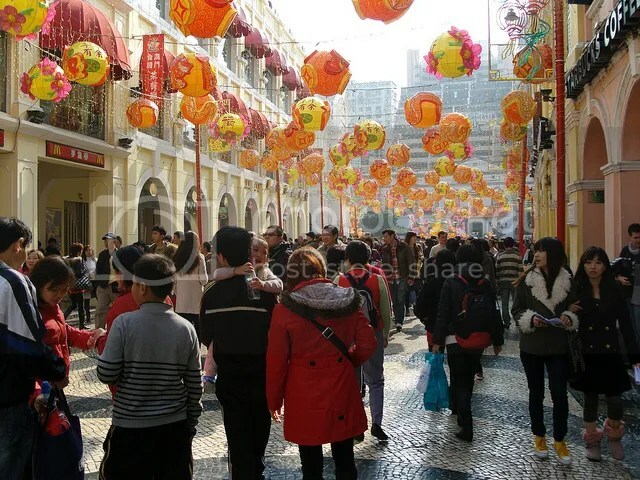 The increase in spending related to Chinese tourism has the potential to increase consumption in foreign markets. Hong Kong, a top destination for Chinese tourists, saw a 500 percent increase in tourist spending from 2000 to 2011. The big effect of this individual expansion is the creation of ethnic and social networks, referred to as guanxi. Both overseas Chinese and Chinese on the mainland exploit these networks to not only expand their business but also their social connections. These networks strengthen the relationships that individuals have within their communities on both the social and space axis, thus becoming defining characteristics of the “global-individual nexus”. To understand this phenomenon Dr. Sun relies on an old Chinese saying in which three generations—a son, father and grandfather—see a flag waving and note “the flag is waving,” “the wind is blowing” and “your heart is moving” respectively. The wisdom in this saying is that when you examine a phenomenon from a substantial rather than relational perspective you tend to focus on static conditions rather than the underlying dynamic conditions. Dr. Sun concluded his talk by explaining that global connections are not only making Chinese society stronger than ever but are also changing it in fundamental ways. With increased globalization, individuals become especially globalized. They change within and also affect the societies they live in. The transformation of local societies through these massive global connections give further evidence that the micro-globalization approach can bring a fresh face to our sociological understanding of globalization. While extolling the virtues of globalization in expanding Chinese society, the elephant in the room is the undoubtedly environmental and ecological ramifications of China’s own growth. The thick smog that reduced visibility in the northern city of Harbin to less than 50 meters last week and shut down roads and airports was only the most recent of China’s endless environmental woes. These issues not only negatively impact the lives of people living in China but also represent tangible roadblocks to China’s progress. The country is particularly susceptible given that China is both the world leader in coal consumption and largest emitter of carbon emissions. Ultimately, it will be up to the state apparatus to determine the path forward in balancing growth while managing the positive and negative externalities that are produced.